Many times, I feel like I need to make a choice between having the comfort food I crave and consuming something healthy. This is disappointing, of course, because I really want both. The pleasure in eating something that is tasty and comforting does not last very long if I feel like I blow through a lot of calories to eat it, especially if it was particularly rich or heavy. Calorie remorse is the enemy of happy consumption, and I avoid it at all costs. Creamed chicken over biscuits is one of those decadent sounding things that you’d expect would be a terrible choice for the calorie conscious. In the hands of Paula Deen or without regard to portion size, it sure could be. This recipe is heavy on the vegetables, includes flavorful chicken and a creamy gravy, all served over a biscuit. And comes in at 117 calories per serving. As a point of comparison – that’s almost the same as just one ounce of cheddar cheese. And if you’re like me, that means that you can have the comfort food for dinner and still feel okay about eating that cheese later because you were so darn calorie-thrifty. The creamed chicken part of this recipe is super easy to make, requiring only a little prep and cooking time in the crock pot. I used canned biscuits (see all my biscuit notes below), so the time between when we got home and when we sat down for dinner was only as long as it took for the biscuits to bake and to serve it up. The kids loved this meal, particularly the biscuits. Even the child who just earlier this week said he “did not care for dough”. 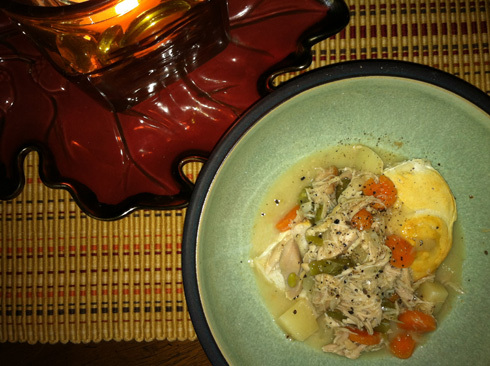 Add chicken, green beans, potato, and carrots to a crock pot. Preheat oven and bake biscuits according to the package directions. Split biscuit in half and place in a bowl, top with 2/3 c. creamed chicken. – Feel free to use milk or cream in place of the soy creamer used here. – There are LOTS of kinds of canned biscuits to consider. I chose a store brand (Food Club) that had small-sized biscuits that were also non-dairy. If non-dairy is important to you, it is easy to overlook canned biscuits as an option, especially since most are described as “buttery” or “buttermilk”. I’ve found that many times, store brands are non-dairy, inexpensive, and pretty tasty. – More about the biscuits. The biscuits I used in this recipe were 50 calories each, so adjust your calories accordingly. At our house, we each ate more than one, but because they were only 50 calories each, I didn’t feel bad in having a second. – Last thing about the biscuits. Next time I would buy two cans because they went so quickly, and everyone wanted a few extras. we made this yesterday and it is just as good on day 2. I realized I want an “ask calamity” column. I have a list… What do you think? (that’s the first question). I’m so glad you tried it AND liked it! And, to your question, OKAY. Is this what you had in mind?